An ideal case for your cymbal transport needs. The SKB Rolling Cymbal Vault is an ideal cymbal case for your cymbal transport needs -- including your 24" ride! Roto molded of rugged Linier Low Polyethylene with a welded center post, the CV24W Rolling Cymbal Vault holds as many as seven cymbals, including the latest 24" ride cymbals. 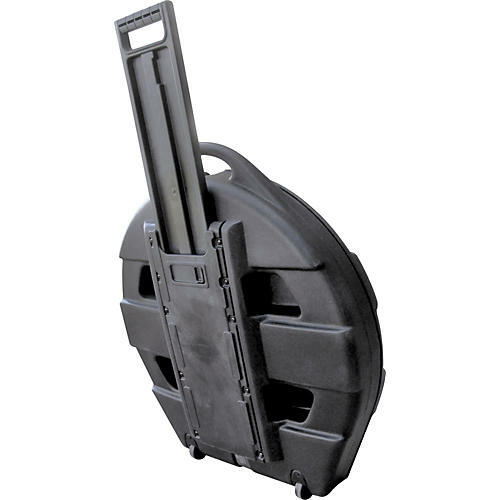 Perfect transport for your cymbals, the Rolling Cymbal Vault is designed with a molded-in ergonomic carrying handle, in-line skate-style wheels and an extra strong pull-out handle. It also includes a convenient storage pocket and four cymbal pads for protection so the cymbals will travel without rubbing together. Molded with the "X" pattern the new 24 inch cymbal vault will stack with the SKB-Roto-X Drum Cases and features a sturdy, high-tension slide release buckle with heavy-duty web straps for easy closure. End the wrong kind of crashes and order a vault today!